Your operating system has some useful networking tools that come in the form of command line utilities. Here are two basic ones that you should familiarize yourself with. 1. Ping: The ping command What Is A Ping, And Is Zero Ping Possible? What Is A Ping, And Is Zero Ping Possible? Ping is a command used to measure the latency between two devices on a network. When your internet feels fast, you're experiencing a low ping. But why does your ping change, and how can you... Read More sends a packet of test data from your computer to another network device. Its results tell you whether setting up the connection between your computer and the recipient one was successful and how much time it took. Ping is often used for troubleshooting network-related issues. 2. Ipconfig: This command gives you a quick way to pinpoint your IP address. Just type ipconfig at the command prompt and hit Enter. You’ll find an overview of your current network configuration, complete with the IP address, subnet mask, and the default gateway. Ipconfig paired with some specific parameters can be used to execute other actions. For example, you can use ipconfig /flushdns to erase the contents of the DNS resolver cache. This step is helpful when you have changed DNS values and want your computer to fetch addresses from the updated servers. 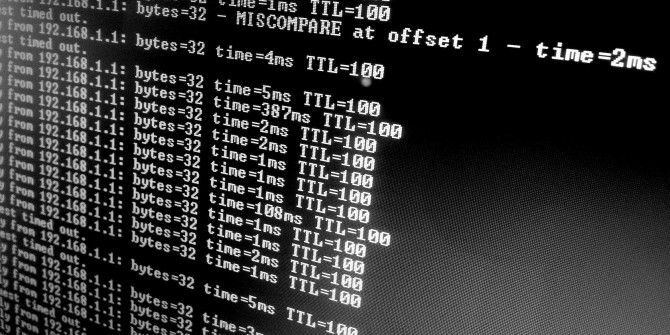 Ping and Ipconfig are handy terminal commands, but they’re not the only ways to gather information about or diagnose network connections. They have GUI equivalents both in the form of desktop utilities and Web-based apps. Terminal utilities like these work on Windows, Linux, and OS X. The catch is that sometimes they need a slight tweak in syntax or execution depending on the operating system. For example, on OS X, the ping command will continue to ping the network until you press Ctrl+C to abort the process. Another example is that ipconfig is ifconfig on Linux. Have you used the command prompt to resolve networking issues or find networking information? Or do you prefer to stick to GUI-based utilities instead? Tell us in the comments! Explore more about: Command Prompt, Computer Networks, Terminal. the "ifconfig" command is used on Mac OS X as well as all other Unix/Linux variants; "ipconfig" is exclusive to windows. There are a ton of these little command-line utilities, especially in Unix/MacOS X operating systems, that are powerful for doing things like finding files, moving filesystems around on a system, etc.